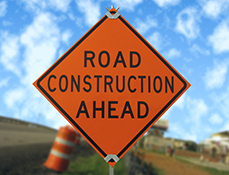 It’s nearly summer and road work is in full swing on state highways and local roads across the country. That means drivers and road workers are thrown together in what can be a contentious relationship. Road workers spend long hours in sweltering heat working with dangerous equipment, all the while keeping one eye over their shoulders on traffic moving (often speeding) through the work zone. Drivers often are delayed, stuck in long backups as multiple lanes of traffic must merge into one and squeeze through the work zone like sausage through a grinder. It can be a recipe for disaster on both sides of the cone. But it doesn’t have to be if drivers do their part to keep the work zone as safe as possible. Despite popular beliefs, work zones aren’t there to inconvenience you or keep you baking in your hot car like a potato in the microwave. They’re actually necessary to improve road conditions. Work zones can be a test of driver patience, courtesy, and respect. Here are some tips to help you pass that test with flying colors (without speeding). Stay alert. Traffic patterns and speed can change suddenly in a work zone. Ignore distractions like your cell phone, passengers, the radio, and the scenery and give the road your full focus. Keep your headlights on for visibility (in many states it’s required by law). Obey signs to taper into a single lane. Don’t be rude by zooming ahead and squeezing into line just before the work zone entrance. Remember those kindergarten lessons: single file and wait your turn. If you’re in two-lane traffic with a designated merge point, keep traffic flowing in both lanes to the merge point. Don’t be a bully by blocking a lane so no other drivers get ahead of you. Obey the posted work zone speed limit. Fines often are doubled in a work zones. Keep your distance and don’t tailgate other vehicles. Traffic can stop suddenly and traffic patterns can change in a work zone. Be especially careful in nighttime work zones. Bright lights and reflective traffic cones and barrels can be distracting to the eyes and make visibility a challenge. Watch for and obey flaggers. Imagine standing on a highway in 90-degree heat for many hours with nothing between you and a 1-ton truck except the “Slow” caution sign in your hands. Respect the flaggers (and give a little wave as you pass by). Avoid construction zones if you’re aware of them in advance. Taking a different route to avoid a work zone will pay off in patience even if the alternate route is a few miles longer. Stay in your lane through the construction zone. Many work zones restrict lane changes because changing lanes can cause an accident. Did you know that a car traveling 60 mph travels 88 feet per second? That means when you see a sign that says “Road Work 1500 feet,” you’ll be at that zone in merely 17 seconds. At 50 mph, a car needs 300 feet to stop on dry pavement, 400 feet on wet pavement. Tractor-trailers and other large vehicles need even more distance to stop at that speed. Rear-end collisions are the most common accidents in work zones, and most happen in summer and fall. Drivers who tailgate vehicles in front of them don’t have enough time to stop suddenly. Keep a 2-second distance between you and the next vehicle. To do that, pick a point (a traffic cone, a sign, whatever) and count “one one-thousand, two one-thousand” between the time the vehicle in front of you passes that point and you pass it. If you reach that point before the second count, slow down and put more distance between your vehicles. The distance required to keep that 2-second space will increase as you drive faster. Be courteous, patient, and respectful in work zones. Anger and frustration only make the drive seem longer. Remember, road workers want to get home safely, too. How do you handle traffic backups? Share your tips here.